For New Ticket: Customers can choose to open a ticket for priority service or for normal service. If a user chooses a priority service then we generate a billable item that will include an invoice. 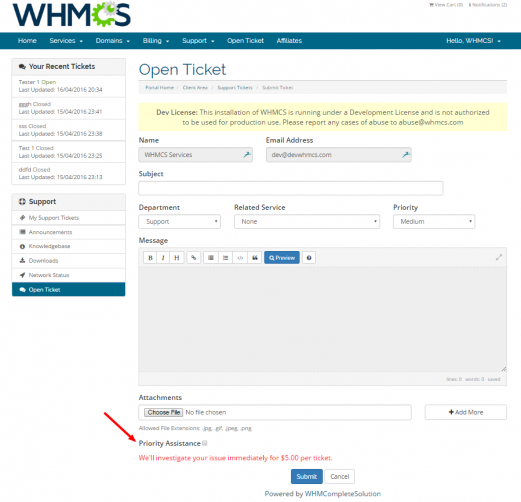 For Generated Ticket: Customer will be shown the option to choose priority service on a sidebar. If a customer selects this service we will generate an invoice and customer needs to pay this first before a ticket is answered. In a few more weeks you should be seeing more news for these modules as well as for module updates. I loved this so much, I had some customization done to it. This is a fantastic idea!! Start with this and they can customize it to your likes! Great idea to make extra income. Very easy to setup. The WHMCS Services support team is the best keeping modules up to date and also helping with any questions. Highly recommended!! While we don’t use this addon anymore it is a very good one if your looking to allow customers to pay for faster support. Very simple with a lot of customization. Support as always is superior to any other module company! Both our company and our customers love this addon! Great for really distinguishing what is a priority! 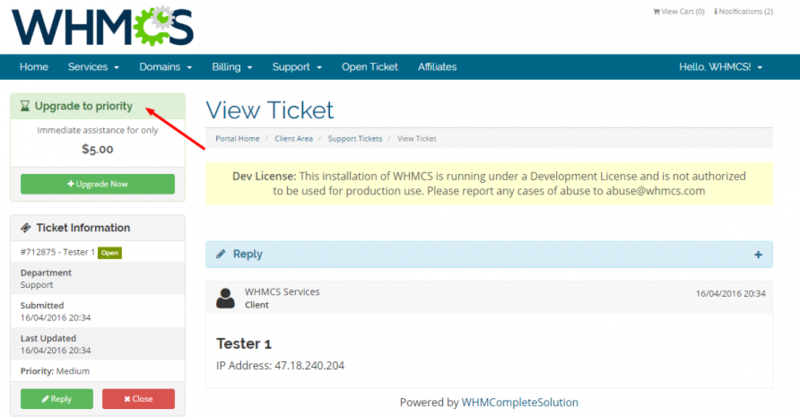 One of the best whmcs addons.